Hudson River Park - Enjoy free popcorn along the Hudson River for movie Wednesdays. 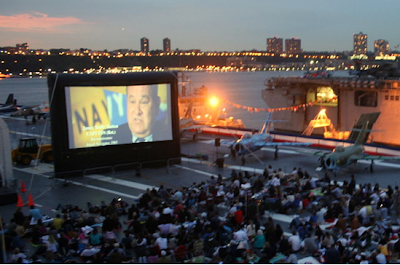 Intrepid Museum Summer Movie Series - Bring a blanket and enjoy the water views, giant dinosaurs, and classic planes on this massive ship. Brooklyn Bridge Park Movie with a View - You still have four more chances to catch a glimpse of some serious oldies-but goodies, including 'Breakfast at Tiffany's' and 'Rosemary's Baby'. Flicks begin at sunset, but arrive early for live DJ sets, and summer lovin'.